West’s Trevor Staggs attempts to make a catch on a flyball from behind the plate. West’s Cade McNeil works from the stretch. Wheelersburg’s Athan Temponeras begins to step into his swing on Thursday evening. West’s Garrett Hurd greets his father, Jason, at first base after notching a single. 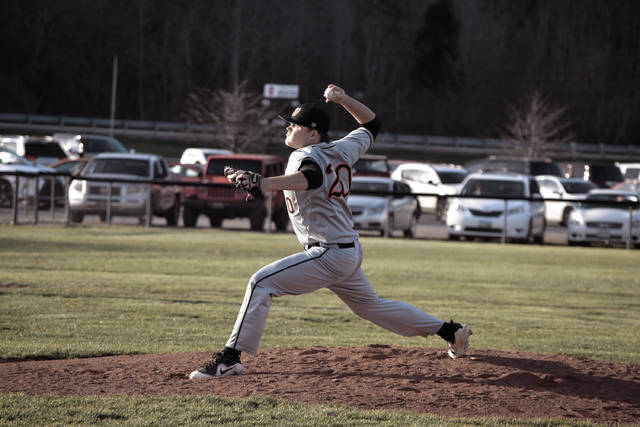 Wheelersburg’s Cole Dyer begins to move as a pitch is thrown on Thursday evening. Wheelersburg’s Matt Marshall throws a pitch from the hill. WEST PORTSMOUTH — Before Thursday evening’s contest, it was safe to say that two-way standout Cole Dyer was on a hot streak. 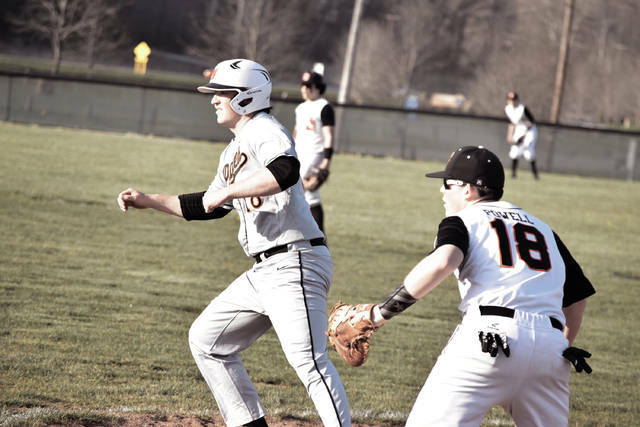 After all, Wheelersburg’s senior third baseman/pitcher had accumulated six home runs over the Pirates’ first six baseball games heading into tonight — including a 2-for-3 effort with a three-run homer, four RBI total, a walk, and three runs scored in addition to putting in six innings of work on the bump against Minford in a 9-6 Wheelersburg victory the night before. However, Dyer’s performance against West, even by Wheelersburg standards, was exceptional. In what proved to be an offensive explosion to end all explosions, Dyer hit not one, but two three-run homers — off of two different pitchers — in one inning for his seventh and eighth home runs of the season in just seven official games. His six RBI in the opening frame of action allowed Wheelersburg to jump out to a 10-0 advantage after one frame of play, and his 4-for-4 day at the plate with four runs scored allowed the Pirates to ultimately claim a 16-7 victory over the West Senators’ baseball program in a wild affair where both units combined for 30 hits over the course of the evening during an SOC II bout that was played in West Portsmouth. 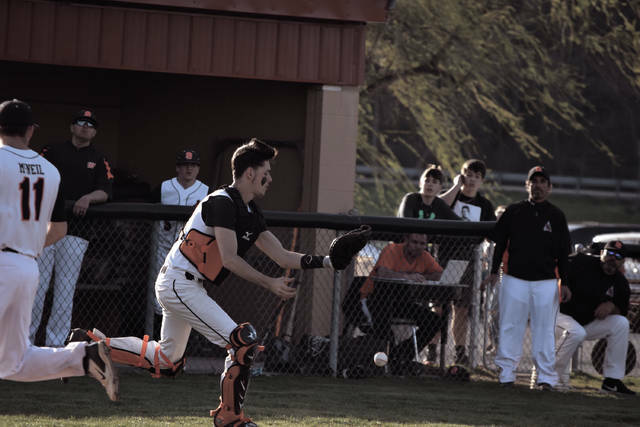 For Michael Estep, the weather that was present in Thursday evening’s bout simply provided a perfect recipe for opportunistic hitters to capitalize. 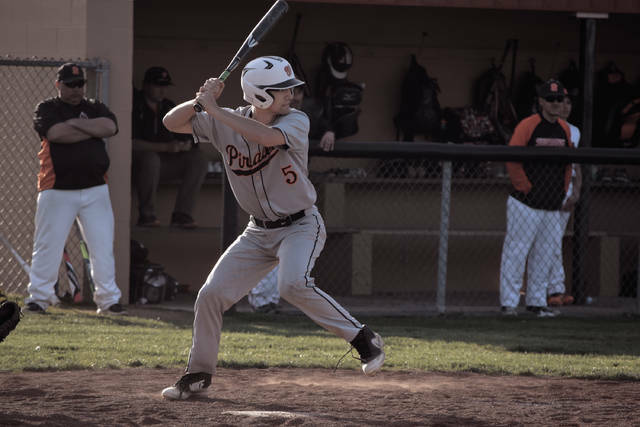 As for Chris Rapp, his Senators simply couldn’t slow down what proved to be an impressive Wheelersburg attack, as the Pirates finished with a total of 19 hits on the evening alone. After a leadoff single from Trey Carter back up the middle and a walk by Jalen Miller to start things off, Dyer wasted no time getting the ball rolling as the power hitter stepped up to the plate and hammered a three-run blast that landed well over the center field fence to put Wheelersburg up by a 3-0 tally. Then, after a Connor Mullins single, an RBI double by Athan Temponeras that scored Mullins, and two free passes that ultimately led to back-to-back RBI singles by Carter and Miller — the former of which was a two-RBI base knock — that pushed the score to a 7-0 margin, Dyer stepped up to the plate, and with Cade McNeil on the mound in place of starting hand Marty Knittel, cranked a second three-run homer over the left field fence in the same frame. The well-tagged baseball, which completely cleared a white SUV parked just beyond the outfield fence, put the Pirates up by a 10-0 tally after an inning of work. However, it wasn’t just Dyer who was coming up big at the dish — it was the entire team, from top to bottom. 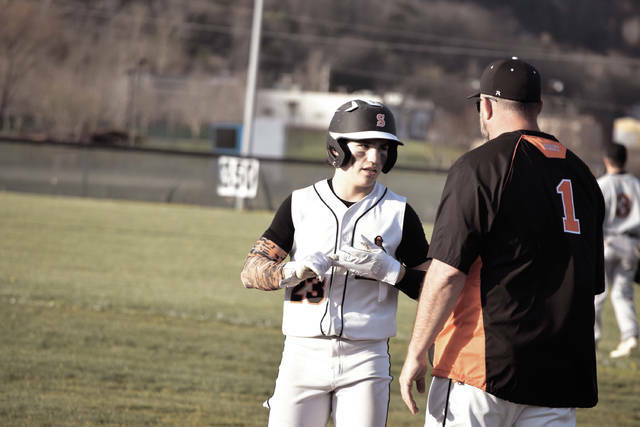 That was especially evident in the third inning, when Wheelersburg obtained four consecutive RBI base knocks from Mullins, Temponeras, Jarrett Stamper, and Jaydren Guthrie to push the lead to 14-0 as Carter, Dyer, Mullins and Temponeras all came around to score to push the gap to a 14-0 advantage after three innings of play. On many of those hits, the lead runner was able to advance from first to third as the Pirates took their aggressive approach at the plate onto the basepaths. Carter (3-for-4, two RBI, three runs scored), Mullins (3-for-5, RBI, two runs scored), Temponeras (2-for-5, double, two RBI, two runs scored), and Guthrie (3-for-5, walk, stolen base, two RBI, run scored) all put together multiple hits for the contest to join Dyer in the multi-hit parade. To West’s credit, however, the Senators fought back. 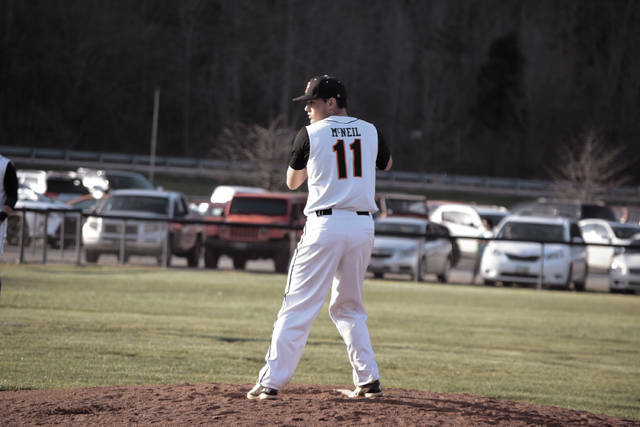 After a leadoff single from Cade Powell and a double to left center by Cade McNeil put runners on second and third with nobody out, Trevor Staggs’ single scored Powell, while two Wheelersburg errors allowed McNeil and Staggs to come across as the Senators scored three in the fourth. Then after a strong play by Drew Cassidy to rob Guthrie of a base hit in the top of the fifth frame, Dylan Bradford started a major two out rally with his RBI single to left field, then came home himself on a passed ball that allowed West to prevent the mercy rule and close the gap to a 14-5 count after five innings of play. That preceded another two-run frame by the Senators in the sixth inning, where Cassidy’s and Knittel’s singles, along with a walk to Bradford, allowed Staggs to drive in a run with a single to left field. A bobbled ball on the exchange in the outfield ultimately allowed Cassidy and Knittel to score on the play as West clawed back to within 14-7 after six complete. Staggs Staggs (3-for-4, two RBI, run scored) and Garrett Hurd (2-for-5) led a very solid 11-hit outing for the Senators. In the top of the seventh, however, Wheelersburg wasted no time closing the deal. After a leadoff single from Dyer and a walk by Carmichael, Mullins and Guthrie put the finishing touches on the affair as RBI singles from the pair set the final score, with Guthrie coming on in place of starting hand Matt Marshall en route to pitching a 1-2-3 seventh frame. With the victory, Wheelersburg moved to 5-2 overall and 5-0 in the SOC II with the victory. A rematch with Minford awaits on Friday at Minford and is immediately followed by a home doubleheader against Hillsboro on Saturday. As for West, the same rules apply, especially with a matchup at Valley looming.